As a program advisor for the Udine Far East Film Festival in Udine, Italy, I have spent the last few months scouting Japanese films for the next edition, which will be held April 26 to May 4. This doesn’t mean I’ve seen all the upcoming releases — sales companies are often not ready to screen their Golden Week or summer films so early in the year — but I am building up an idea of what might and might not work for our audience. Looking at the 2019 line-ups from domestic distributors, I see the same puzzle-plot mysteries and weepy romantic dramas that appear as regularly on local screens as the cherry blossoms do each spring. With a few exceptions, these films, which are green lit for their idol stars or on the basis of their source material, be it a manga or best-selling novel, are hard sells outside of Japan. Other perennials are the sentimental, sluggishly paced family or social- problem dramas, that are usually set in the remote countryside, which tend to appeal to older audiences but put this older reviewer in a coma. Also high on my must-see list is “Katsuben!,” Masayuki Suo’s new film about an aspiring benshi (silent film narrator) in a small Japanese town a century ago. Starring Ryo Narita as the benshi, the film will be released in December. No trailer is online yet, but Suo promises a film that will be “all entertainment.” One reference point is his hit 1996 comedy “Shall We Dance?” in which Koji Yakusho’s shy salaryman hero transforms into a competitive ballroom dancer. I’m also looking forward to Kiyoshi Kurosawa’s “To the Ends of the Earth.” Filmed on location in Uzbekistan, the film stars Atsuko Maeda as a TV variety show reporter who goes on a journey of self-discovery in the Central Asian country. It’s something of a follow-up to “Seventh Code,” a 2013 Kurosawa suspense film featuring Maeda as a woman who travels to Vladivostok to meet a sketchy Japanese guy. The film itself was slight, but Maeda impressed me with her committed performance. Judging from the trailer for the new film, which shows her in a flat-out run, Maeda has again given her all for Kurosawa. The release is scheduled for the summer, after the film’s likely premiere at Cannes. Another Cannes regular, Hirokazu Kore-eda, has filmed “The Truth,” a drama about an actress’s prickly relationship with her adult daughter who has recently returned from the United States. Shot in France and based on Kore-eda’s original script, the film stars Catherine Deneuve as the actress and Juliette Binoche as her daughter. Given the spotty quality of the films Japanese directors shoot abroad, it’s best not to get your hopes up. But it will be interesting to see how Kore-eda works outside his family-drama comfort zone. The film is another likely Cannes invitee, with its Japan release coming on an as-of-yet unspecified date after the festival. Meanwhile, domestic distributors are already beating the drum for releases targeting Golden Week — a peak box office season. Toho will weigh in with “Kingdom,” a period action film based on Yasuhisa Hara’s best-selling manga. Set in China during the Qin Dynasty (221-206 B.C. ), the film stars Kento Yamazaki as a war orphan with ambitions of becoming a great general. After a fateful encounter with the Emperor of Qin he begins to realize his dream. Directed by action specialist Shinsuke Sato and shot in both China and Japan, the film looks to have Sato’s characteristic narrative propulsion and visual flair. Also opening around Golden Week is Gaga’s “Kakegurui,” a fantasy about a teenage girl (Minami Hamabe) who transfers to a high school where the student hierarchy is decided by gambling takes. An ace gambler, the heroine soon starts rising to the top. Based on a hit manga by Homura Kawamoto and Toru Naomura, “Kakegurui” has already spawned a live-action TV series. The trailer has the over-the-top look and black comic spin of “Teiichi: Battle of Supreme High,” Akira Nagai’s biting 2017 political satire set in a super-elite high school. 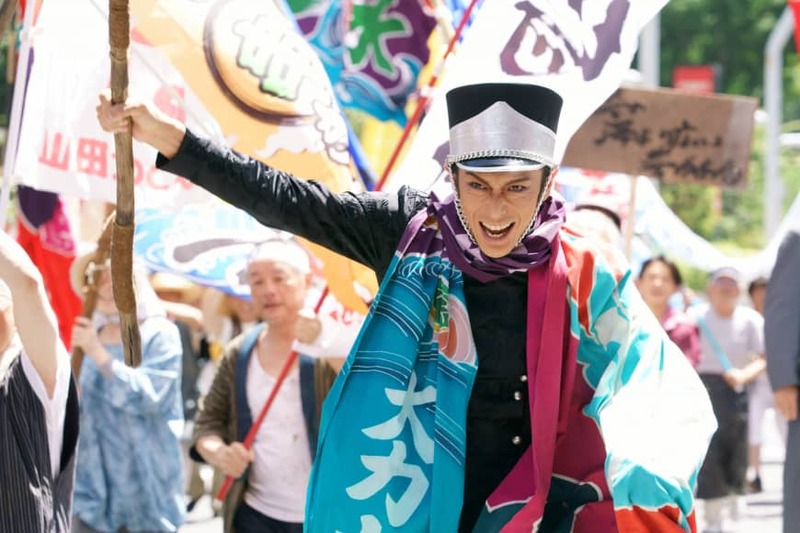 The funniest film I’ve seen so far this year, though, is “Fly Me to the Saitama,” Hideki Takeuchi’s adaptation of a 1980s manga about an alternative-universe rebellion by the natives of the capital’s much mocked suburb. Starring Fumi Nikaido as the cosseted son of the corrupt Tokyo governor and pop star Gackt as a mysterious transfer student at the son’s private academy, the film is packed with in-jokes targeting the titular prefecture. As he did with his 2012 time-travel comedy “Thermae Romae,” Takeuchi also nimbly crosses cultural barriers, this time with hick-versus-city-slicker comedy that anyone who has ever been either can understand. One film likely to divide audiences rather than unite them is “The Great War of Archimedes,” Takashi Yamazaki’s drama about the building of the Yamato, an iconic World War II battleship. Based on Norifusa Mita’s manga, the film unfolds in the early 1930s when the Imperial Japanese Navy is faced with two competing proposals: one for a modern aircraft carrier and one for the soon-to-be-outmoded Yamato. A supporter of the former plan is Isoroku Yamamoto, the admiral best known as the leader of the attack on Pearl Harbor. Starring Hiroshi Tachi as Yamamoto, the film is a thematic follow-up to “The Eternal Zero,” Yamazaki’s 2013 smash hit about suicide pilots that stirred up controversy with its soft nationalism. “The Great War of Archimedes,” which opens July 26, may make some nostalgic for the glory days of the empire — and others grateful the navy backed the wrong seagoing horse.